Elaine Rawlings Bridal Boutique is an intimate and exclusive bridal boutique located in the glamorous Georgian Princes House in Truro. With a guaranteed private one-to-one appointment and a selection of gorgeous gowns from leading designers such as Justin Alexander, Sincerity, Ellis, Romantica and Callista, Elaine offers a personal welcome and a friendly, relaxed environment to help you find the dress of your dreams. As the longest standing bridal boutique in Truro, Elaine has built a reputation for her expertise, experience and level of care, treating each bride as unique. Wedding Dresses and Bridal Gowns in Cornwall. Based in the main street of Camborne, Cornwall, Little Anne-Maids is a wedding centre that offers a wide range of wedding products and bridal services to help make your wedding day special. We also cater for all other special occasions such as evening wear and prom dresses. The Bridal Box is your premium supplier of beautiful Wedding Gowns, Bridesmaid Dresses, Wedding Shoes, Tiaras, Veils and Wedding accessories - the boutique is open until 7pm on Tuesdays, Wednesdays and Thursdays. Lovely was born (as many great ideas are!) over a bottle of fizz with friends. Imagining our dream bridal shop, we came up with a completely fun and relaxed shopping experience, filled with funky styling, and which of course offered a totally rocking collection of bridal designers for all women. 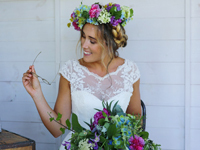 Complete with picture-postcard views across St Ives, this chic boutique houses a stunning selection of bridal gowns from the likes of Sassi Holford, Eliza Jane Howell, Charlotte Balbier, Belle & Bunty and So Sassi. Prepare for fashion-forward styles and vintage glamour through to full-on fairytale, as well as accessories from Glitzy Secrets and shoes from Charlotte Mills. At The Wedding Company we guarantee to offer you a premium wedding dress shopping experience from the moment you walk into our store, providing an excellent customer experience is the cornerstone of our business. Our range includes Charlotte Balbier, Pronovias, W1 White One, Manuel Mota, Chic, Hollywood Dreams and Sandals Destination Bridal. These designers have been specifically chosen by us for their high quality range of styles from classic to contemporary. To complete the party we also have Dessy and Hilary Morgan bridesmaids dresses, Paradox and Rainbow Club shoes and a large range of accessories. Isabelle Montagu boutique is located at Castle Street Studios; a collection of creative independent businesses on Exeter’s Castle Street. We offer relaxed and personal consultations by appointment. Isabelle Montagu is the signature ready-to-wear collection by designer Phoebe Stockman. Phoebe can offer bespoke customisation and alterations to her Isabelle Montagu gowns. To compliment the gowns, our boutique showcases Bohemies, beautiful handmade hair accessories by Eva Stockman. With over a decade of bridal expertise as designer of the award-winning label Kate Sherford, Kate specialises in beautiful couture bridal design. Gowns from designers Paloma Blanca and Augusta Jones have been hand picked to complement her Kate Sherford Collection, offering an exquisite range of traditional and contemporary styles. In addition, the Kate Walker Collection gives brides the opportunity to work with her and create their dream, handmade dress. Set in the old West Quarter of Exeter "The House That Moved" -a 16th Century merchants house - is the home of Pirouette. 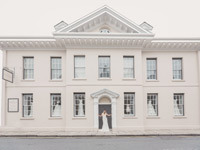 In the privacy of this unique building, explore the different designers showcased here including Maggie Sottero, Jenny Packham, Augusta Jones and Geisha Designs or discuss having something individually designed and made for you. Our beautiful Mansion House, situated in the centre of Truro is an elegant space with a dreamy ethereal feel and is packed full of stunning designer gowns and accessories just waiting for you to come and try on. Book in for The Bridal House Of Cornwall Experience today and let the magic begin! As a multi-award winning boutique we are here to create a magical and relaxed experience for all our brides to enjoy a private appointment in our cosy but chic boutique while exploring our stunning collection of carefully chosen gowns from our designers who include Wendy Makin, Lunanovias, Special Day & ‘Phoenix Gowns’. The Ivory Secret bridal boutique is a cosy, intimate and inspiring space, tucked away at the end of a bustling high street, where you will find an array of handpicked designer wedding gowns, shoes and accessories. Enter our bridal boutique with a warm welcome from owners Liz and Eleanor, a mother and daughter partnership. Wedding dress collections include Catherine Deane and Annasul Y. This unique and exclusive bridal haven also offers bespoke wedding gowns and made to measure bridesmaid dresses. At Truly Delightful we like to think we're a little bit different. We are a small, intimate boutique with over 25 years experience; so if you're looking for style, glamour & sophistication & want your dress shop to be passionate about design, fit, quality & you, with prices ranging from £400-£1400, then come and be "truly delighted". For timeless elegance, designed and hand-crafted exclusively for you, talk to Christine at Christine Trewinnard Couture. Drawing on many years’ experience at top London Couture Houses, where she worked closely with designers and hundreds of clients to create unique garments, Christine is well placed to advise, help design and create your perfect gown. Budleigh Salterton’s beautiful boutique houses a stunning selection of heirloom gowns ranging from the late 1800's through to the 1980’s. From fine lace and slipper satins to intricate beading and gloriously draping fabrics, the boutique also offers an exclusive collection of medieval hand woven silk bodices and wedding gowns, making it a definite must-see for brides desiring for some dreamy vintage fashions. Sister Organics is a collection of wedding and bridesmaids dresses made to order in Dartmouth, Devon. Natalie uses organic cottons, organic silks, cotton lace and other sustainable fabrics to create relaxed and informal wedding outfits. Bespoke service available. Whether you want to wear it again as part of your extended celebrations ( or just for fun! ) or stow it away as a family heirloom, your wedding dress can wind up less than perfect after the days of I Dos, but some expert cleaning by L J Laundry Services can help to return it to its original glory. To ensure that it’s properly cleaned and packed away to preserve the most precious of gowns for years to come, staff painstakingly scan every inch of your dress to remove the smallest of stains and fix things such as loose beading using a special lagoon cleaning system on the most delicate of fabrics for spotless results. You then have the option to pack your dress in one of their beautiful handmade storage boxes by The Empty Box Company, which offers protection from light and dust that can damage a dress over time. Comprised of pH neutral materials to prevent any fabric discolouration, the boxes allow air circulation to eliminate the risk of mildew and what’s more, they can come in a beautiful pattern of your choice.